Stroll the stratified streets of Pullman for a look at a seminal moment in labor-union history. SANCTUARY When Pullman laborers got restless, rich folks sought safety at Hotel Florence. 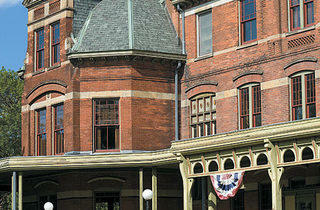 It takes imagination to envision the harmonious company town George Pullman had planned. As Jeffrey Helgeson, administrative director of the Labor Trail Project, tells it, what’s more palpable on a Pullman walk—amid streets lined with red-brick houses mapping a social strata that persists today—is the legacy of working-class anger that fueled the violent Pullman strike and signaled the downfall of the sleeping-car magnate’s utopian experiment. Things started to go downhill in the summer of 1894—4,000 Pullman Palace Car Company workers, along with 125,000 sympathizers in the American Railway Union (ARU), started striking in reaction to wage cuts, bringing the company, town and railway traffic west of Chicago to a standstill. At the behest of President Grover Cleveland, U.S. Marshals and 12,000 army troops arrived in Chicago several weeks later to break the strike. Rail is still the best way to travel to Pullman. Hop off the Metra Electric Line at Pullman/111th Street. Head east along 111th Street, and to the left you’ll see the Pullman Clock Tower and Administration Building (111th St and Cottage Grove Ave), the company’s former clerical offices. 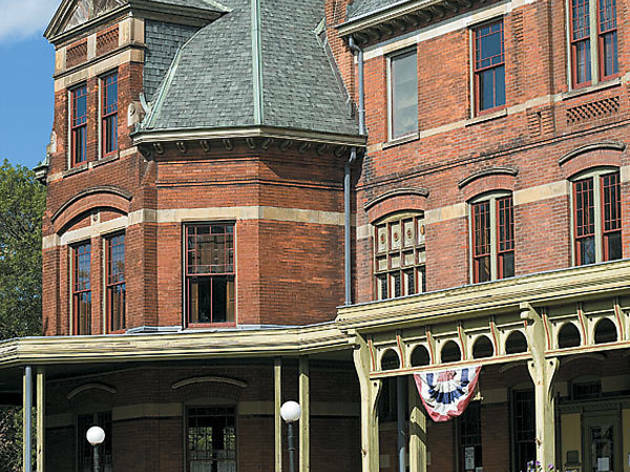 Continue east and look to the right at the corner of 111th Street and Forrestville Avenue, where you’ll see the 70-room Hotel Florence, now home to the Historic Pullman Foundation. This is where the pro-Pullman aristocracy holed up when the strike broke out. Named for Pullman’s daughter, the Florence is a four-story, Queen Anne–style brick building with numerous gables and a veranda. BULLY PULPIT The United Methodist Church hosted both pro- and anti-strike speakers. Hang a right and head south down Forrestville Avenue toward Arcade Park (Forrestville Ave between 111th Pl and 112th St), former site of the Arcade Building, which housed shops and a 1,000-seat theater. Walking east on 112th Street, check the lavish residences of Arcade Row, including the home of John P. Hopkins, Chicago’s mayor during the strike, at the southwest corner of 112th Street and St. Lawrence Avenue. Hopkins aided the strike with 25,000 pounds of flour and meat, and the use of a room above his nearby store. On the southeast corner, note the gleaming, emerald-hued, serpentine rock of the Gothic-style Greenstone United Methodist Church (11211 S St. Lawrence Ave), where competing preachers used the pulpit to both denounce and support the strike. Go farther east on 112th through the Romanesque columns of Market Hall. When Pullman was a company town, this was a food market; now, it’s gone condo. Exit on the south side down Champlain Avenue, lined with middle-class “workers’ cottages”—two- and three-story row houses. At 114th Street, turn left and walk until you hit Langley Avenue, where Pullman’s least-desirable housing—cramped “block houses” for less-skilled workers—remains. The Langley Play Lot, on the east side of Langley just north of 113th Street, is the spot ARU founder Eugene V. Debs rallied thousands of workers by proclaiming, “You are striking to avert slavery and degradation.” Directly north of the playground are larger tenement buildings, where 300 to 500 people lived in inhumanely cramped quarters. At Langley and 111th Street, take a left and head west. Officers’ Row, on the south side of 111th Street between Langley and Champlain, features executive mansions. Before catching your Metra train back home, stop on the north side of 111th Street west of Champlain, and take a look at the mounted historical photo of some 6,000 laborers marching to work en masse. Although the Pullman strike was broken after a few weeks, laborers showed American corporations that the wrath of a united working class was a force to be reckoned with. Do you think laborers rose up against George “I’m cutting your wages” Pullman on an empty stomach? Nope, and you shouldn’t hoof it through the historic ’hood while hungry, either. Grab some greasy-spoon grub at Cal-Harbor (546 E 115th St, 773-264-5435), a ’50s-era breakfast-lunch throwback across the street from the former Pullman Company steel foundry.